Our program regularly invites the honors students to attend campus and community events, and we ask students to try to attend at least one per term. We recognize how much learning takes place outside of the classroom, and we also want to enrich our students’ college experience as much as possible. Events range from lectures to the upcoming screening of the award-winning documentary, A2-B-C, about the Fukushima nuclear disaster (more on that in a later post) to art talks and art exhibits. For instance, last year we attended art talks by J.S. Bird and Julie Green. 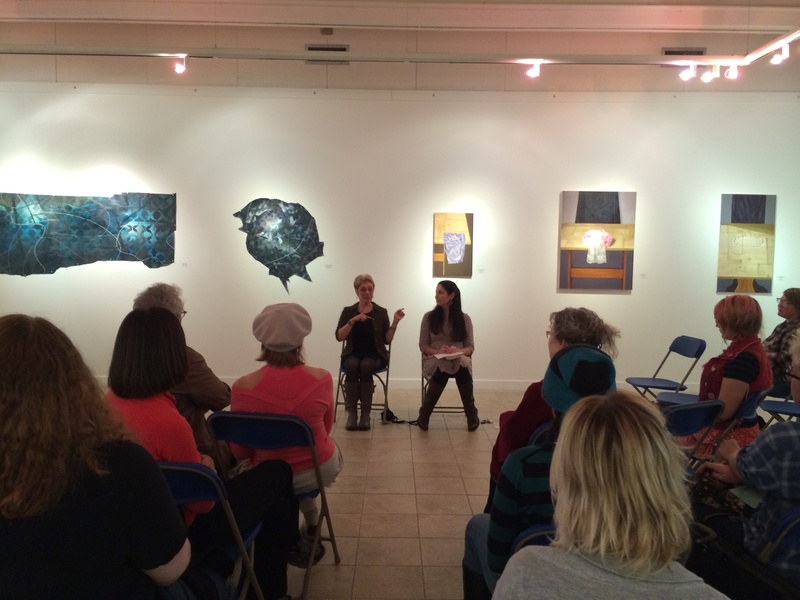 We recently heard Lane art faculty members, Kathleen Caprario and Gabriella Soraci, discuss their current exhibit, Constructed Dreams, at the LCC Art Gallery. Kathleen also teaches our honors Basic Design class. These kinds of activities are, as Theresa A. James suggests, “an important means of creating close ties among the participants of the honors program and between the honors program and the community” (A Handbook for Honors Programs at Two-Year Colleges, 62). They also expand students’ awareness of the many opportunities available to them and encourage students to seek out these experiences on their own or with their peers. Realizing that these events are vital aspects of the college experience not only impacts students’ time at a community college. It increases their chances of seeking out these kinds of opportunities on university campuses when they transfer. There are challenges, of course, to getting students to attend the events, especially at a two-year college commuter campus. Students don’t live on or near campus, and many of them commute by bus. They are also balancing jobs, families, and other commitments, which makes attending events more difficult. Turnout at off-campus venues has been low so far. On-campus events have been more successful because they are held at different times, allowing students to select the events that fit their schedules. In the upcoming year, we’ll work toward increasing the number of these opportunities so that students will find it easier to participate in at least one per term. This entry was posted in Art Talks & Exhibits, Community Events, Uncategorized and tagged Art, Community Events, Gabriella Soraci, JS Bird, Julie Green, Kathleen Caprario on November 1, 2013 by Ce Rosenow.